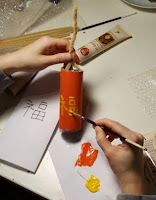 This Chinese Firecracker Craft is safe and fire-free! 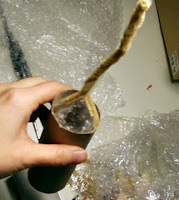 2.Cut a 2x3 inch rectangle of bubble wrap, roll it and put it into the tube. Use a little tape on the top and bottom so it doesn't move around. 3. Paint your tube red. With the yellow paint, paint decorations on the firecracker such as the Chinese word FU (you can use this for reference) or a border of your imagination! 4.Now you can set off your firecracker. Put your fingers or thumbs into the tube and pop the bubble wrap! When the bubble wrap is popped, it sounds like fireworks are going off! (This works best when there is a whole classroom of kids doing this at once!) Happy Lunar New Year!